Among the many Christmas traditions my family holds, one of them is to visit a small retail outfit called Peddler's Village nestled in Bucks County, somewhere west of Trenton and north of Philly. Though I haven't been there aside from the December/January time period, it looks like a lovely place for all seasons. As any village knows, a decent coffee establishment is quite essential. 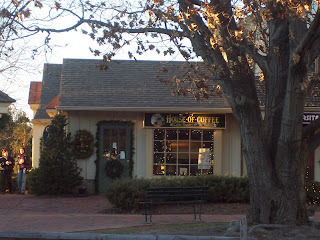 Fortunately, Peddler's Village has its own coffeehouse called (quite originally) House of Coffee, located relatively in the center (I think) of it all. The interior divides into two rooms, one for whole bean sales and one for their coffee bar. Having come here mostly annually for the past 6-7 years, the inside hasn't changed much and kinda comes across functional but very blah, with few colorful accents. They roast the coffee fresh, seeming to focus on both single origins and blends. I've had a variation of experiences with their drip (6-7 years) and since my tastes have fluctuated in that time, I figured I'd pay extra attention this time. Fortunately, they were brewing a medium (not dark) roast, which tasted pretty good that day. Unfortunately, I didn't get to try anything else. Thumbs up for now (my only concern lies in how dark their decafs are, though I've noticed decafs being extra dark in other establishments...). The espresso was quite another story. My doubleshot held a severe bite that I didn't care for in the least. The baristas seemed skilled so maybe the espresso blend simply just lacks the necessary pizzazz? I didn't catch the tea while I was there, though according to the website, it seems they do their own tea as well. Looks good; it'll have to be a drink another day (only 3 hundred-something days til Christmas!). At the end of the day, I would say that the place serves the Peddler's Village niche of a decent coffee establishment. Despite the role House of Coffee has played in my Christmas visits, I still can't say I'm impressed with their operation. Nonetheless, make sure to pop in and try it out if you're by the village (you don't need to wait til Christmas).